Jewellery designer Jill Thompson grew up in Derbyshire and loved walking in the Peak District. Since moving to Dorset in 1990 she has drawn inspiration from the coast and beautiful Purbeck landscape. Her work develops from initial ideas inside her head or sometimes from photos or sketches, often changing direction as each piece evolves. 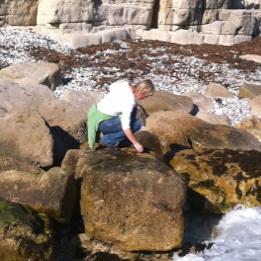 Based in Whitecliff, Poole, she spends hours beachcombing and collecting stimulating objects from the Jurassic Coastline. She trained at ‘Flux’n’Flame based in Dorset and set up jillyflowerjewellery in 2010 after selling her work locally since 2009. All pieces are individually designed and made by hand in her studio. If an item has been sold a similar item can be made to order. Please use the contact page. All items over 7.7g are hallmarked by the Assay Office and stamped with her initials. She loves experimenting with reticulation (surface melting) which creates wonderful textures and one-off pieces of jewellery. As the metal is heated it takes on a different appearance making each piece unique, unlike the mass-produced commercial jewellery found in the high-street shops. Her first collection in 2010 - 'Rockpools' has drawn inspiration from pebbles, seaweed and the lovely shapes formed by ripples and waves. Dorset seaglass and pebbles have been incorporated into some of the pieces. Always keen to make commissions and loves a challenge.